Emma Hewitt never thought she'd travel thousands of miles to wed. Yet Oregon is where she'll meet the groom her brothers have chosen. After years of nursing her ailing father, Emma's social skills are lacking. An arranged marriage is only sensible. 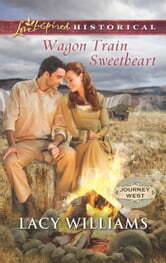 And her growing feelings for Nathan Reed, a worker on her wagon train, are surely better forgotten. Nathan knows he's wrong for Emma. He's too rough, too burdened with guilt over his past. But when Emma nurses him through a fever, she sees something in him no one ever has. Now he wants to be a man worthy of her love. Emma's loyalty to family has always come first. Will she find the courage now to follow her heart?